Scooters have sure changed the face of the Indian two wheeler market, but youngsters have yearned for a sporty, fun to ride automatic scooter for a long time. And when the Piaggio group announced that it will launch an Aprilia branded 150cc scooter, they set a lot of tongues wagging. After all, the brand is known for its scarily fast superbikes more than anything else. So here it is, sporty looking SR150, bearing the badge of the very brand that has given us some brutal machines like the RSV4 and Tuono V4. We've all swooned over the SR150's looks for a while, and now it's finally time to ride it and see if it does justice to the Aprilia brand. For a brand that's acclaimed for its racy designs, the SR150 looks properly sporty. Twin headlights placed on the front apron along with the red and black graphics look aggressive, complimented by a short, slightly high tail and a red-black seat. 32mm telescopic forks upfront and large, 14-inch wheels at both ends complete the package. The footboard isn't too wide or long, and the SR clearly chooses sportiness over practicality. The design of the clocks echoes the sportiness as well, with a carbon fibre look and white background. Pillion footrests sit flush with the body panels which makes for a clean look when folded, but aren't the easiest to pull out on the go. Also, the seating is quite tall, which could be a bit of an issue for shorter riders. The padding on the seat could have been softer too, to make longer rides more comfortable. Under this racy design is the same 150cc, air-cooled single cylinder engine we've seen on the Vespa 150. Outputs are the same as the Vespa at 11.5PS and 11.5Nm. Initial impressions were that some more power to go with the Aprilia name and sporty looks would have been welcome. But the SR150 feels pretty light and acceleration is brisk, especially as you go up the rev range. We found that out on our way back from the shoot location, when we rode the SR150 back through country roads, cutting through traffic with utmost ease. Mid range grunt in fact is surprisingly good, and the SR150 continues to pull strongly even beyond 70kmph, which is where most scooters run of steam. In fact, the SR150 is one of the only scooters that will cross 100kmph on the speedometer. The VBox indicates that it does in fact cross 100kmph and clocks a top speed of 101.3kmph. The VBox tests threw up some good numbers. 0 to 60kmph comes up in 7.2 seconds while 0-100kmph took 29.6 seconds. Engine performance is definitely one of the positives, though some more refinement would have felt better. The SR150's handling package does justice to the Aprilia name complimenting the engine performance well. The scooter feels nimble, is quick to change direction and loves being leaned into corners thanks to its 14-inch wheels and grippy tyres. 14-inch wheels are in fact a dream come true, as they work wonderfully in making the SR150 a brilliant handler. The suspension setup is slightly stiff which aids cornering, especially with the good ground clearance, unlike other scooters where you tend to scrape the stand or the exhaust if you lean too much. But the stiff suspension also makes for a bumpy ride on bad roads, more so when it's just the rider alone. The riding position also leans towards sportiness, but is comfortable for the rider. The pillion seat though feels comfortable only for short rides. The 220mm front disc and 240mm rear drum brakes offer good bite, while offering a sure footed feel, along with ample retardation. Under test, the scooter decelerated from 60-0kmph in 2.59 seconds covering a distance of 18.72 metres which is astonishing for a scooter. With focus on sportiness, the SR 150 was never aiming for the fuel efficiency crown. 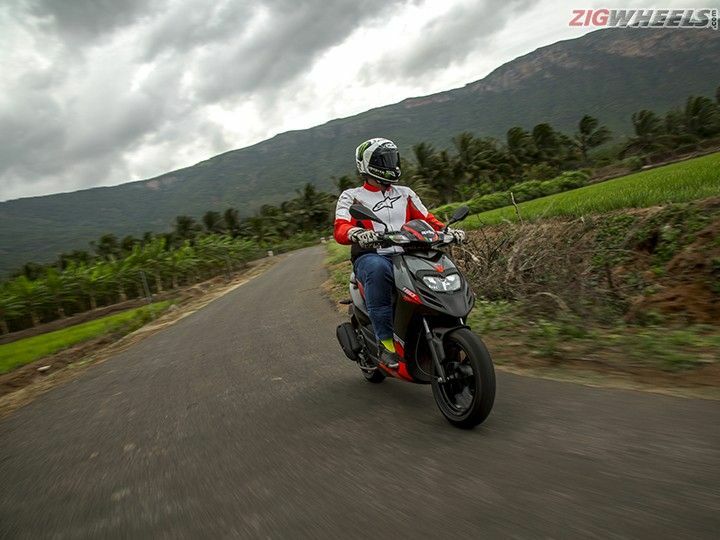 Under our test conditions, the SR150 delivered 37.88kmpl in city riding and 51.45kmpl on the highway. Overall mileage is 44.66 and with a 7-litre fuel tank, should be able to do 300 kilometres on a tankful. We reckon these are pretty good figures given the SR 150’s intent and performance. At Rs 65,000 ex-showroom New Delhi, the SR150 is a great package for a sporty scooter. At that price, it is in fact more affordable than the Vespa 150, which retails at about Rs 88,000 ex-showroom, while also looking sportier. It could be the perfect shot in the arm for the Piaggio group, as they are yet to make a mark with those outside of Vespa lovers and superbike buyers. If you are the types who wants to have a lot of fun on your daily rides, without busting a hole in your wallet, this Aprilia SR150 is a great buy. It can be the perfect hooligan when you want it to be with its performance and handling both, while looking absolutely stunning. Surprisingly the side stand is not part of the package and will be on offer as a compulsory accessory. The SR150 misses out on a brake lock for the rear brake too, though it does get a pass switch for the headlights, something most scooters miss out on. Quality of plastics could have been slightly better and the engine a bit smoother. In my opinion these niggles barely come in the way of the fact though, that the SR150 is one of the most fun to ride scooters on sale today. In fact, SR150 is a great way to own an Aprilia in case you find their brutal superbikes out of reach. Share your experiences with SR 150? Confused about Aprilia SR 150?